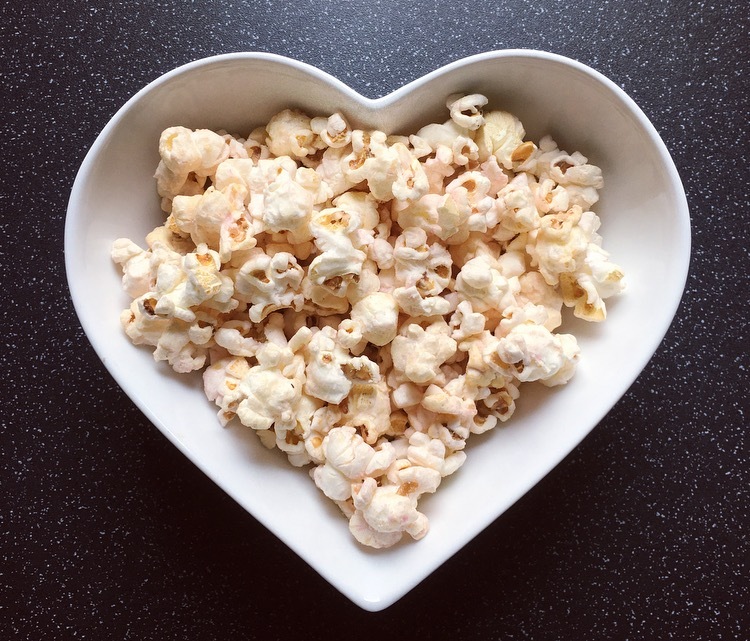 Popcorn is something I bloomin love as you can see from my previous reviews of Propercorn’s tasty varieties. It is a blank canvas for all number of flavour combinations and as such I have been eagle eyed around the supermarkets ever since it was tweeted that Tyrrells had released Tyrrells Strawberries and Cream Poshcorn. First and foremost isn’t this such a glorious flavour to release. Not only is it quintessentially British with its connotations of Wimbledon tennis with a packet to match, it is also another reminder that summer is coming, huzzah! I picked this 75g bag of Poshcorn up from Ocado for a relatively reasonable price of £1.79 and could not wait to get stuck in. The popcorn really didn’t have any smell to it, I am not sure what I was expecting but I thought there might be a whiff or strawberries or at least some sweetness to it. Another thing that took me by surprise was the distinct lack of pinky redness. The soft pink dusting of strawberry flavour on the popped kernels that was evident was certainly few and far between. Tucking in and the kernels were puffed and airy with a little crisp bite to them, just how they should be. As suspected the flavour wasn’t all that consistent. When I did get a pinky number I was greeted by a sweet taste with a hint of fruitless but not exactly identifiable as strawberry. I do question in a blind taste test whether you could guess the flavour as Strawberries & Cream. I can too only assume the cream element is with the fruity flavour not being so harsh and more subtle and smooth but other than that it was pretty undetectable. 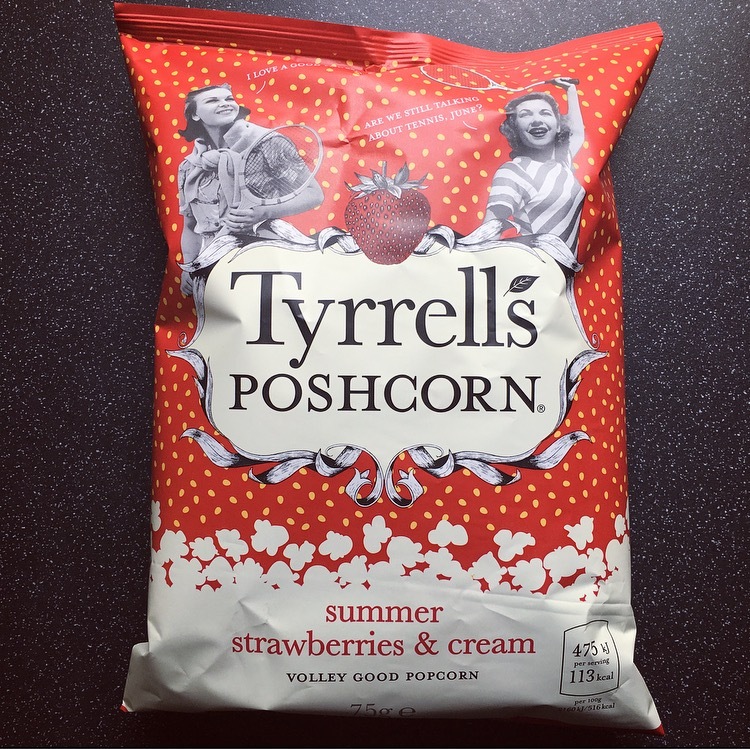 I am glad that Tyrrells have gone for a sweet edge with their new Poshcorn addition, and Summer Strawberries & Cream is pretty posh. I cannot fault the quality of the actual popcorn however the consistency in flavouring is really not there. 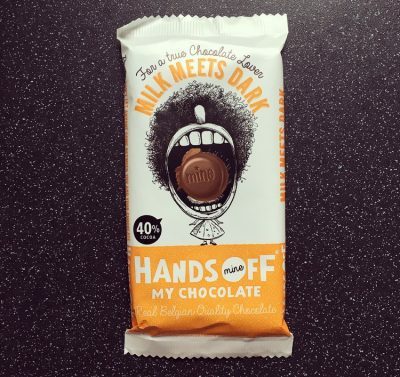 Some handfuls are plain old popcorn and some have a lovely sweet fruity flavour to it, but lets face it unless you get a flavour hit with every handful it’s not going to convince you to go back for more. If Tyrrells can sort that issue out then they will have a winner. Oh dear. See this is why I’m put off by flavoured popcorn, the quality is so inconsistent I find. 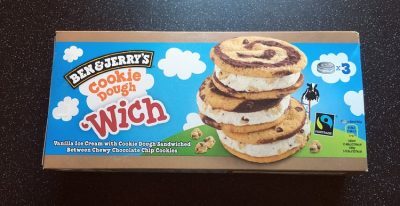 I haven’t really had Tyrrell’s before but other brands have left me disappointed. Butterkist did s strawberry one a while back, that wasn’t too bad but it was quite sweet.